What Are Samsung Apps for Smart TVs? The Simple Tech Guru is an advocate for simple, understandable technology and the need for consumer education. Since the introduction of its first Smart TV in 2008, Samsung has parlayed its experience with smartphone apps as a way to expand the capability of its TVs to not only provide a viewing experience from TV broadcasts, cable, satellite, DVD, and Blu-ray Discs, but also access an abundance of internet streaming channels and other smart capabilities. To access smart features the TV needs connected to the internet. All Samsung Smart TVs provide Ethernet and Wifi so that connection to an internet service router is convenient and easy. Using its umbrella "Smart Hub" interface, not only does the TV viewer have efficient access to TV setup and setting functions, but internet streaming services, such as Netflix, Vudu and YouTube, as well as a full web browser, and, depending on the model, social services, such as Facebook, Twitter, etc. Beginning with the 2019 model year, Samsung includes iTunes as part of it is Samsung Apps selection. It can also be added on 2018 model Samsung Smart TVs via a firmware update. The idea of Smart TV in general and Samsung's approach, in particular, is to offer built-in apps that are accessible on your TV, similar to the way we use apps on a smartphone. When you look at your Samsung smart TV menu, it looks similar to a Samsung (or another brand) smartphone screen. 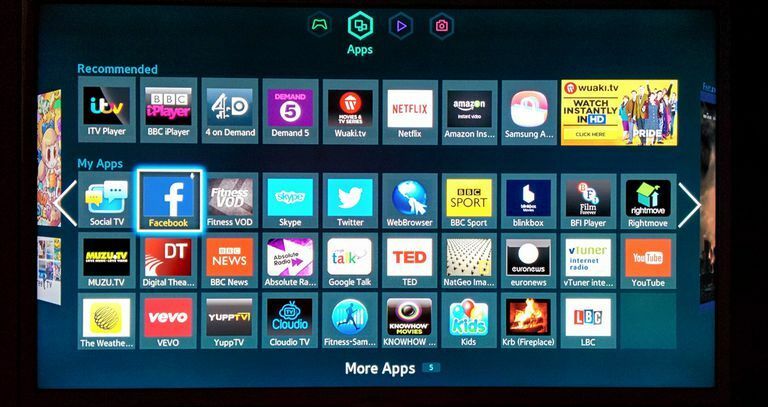 The Samsung Smart TV platform has a few of the more popular apps pre-loaded, with more available that can be downloaded from the Samsung App Store. The additional apps are accessible via the TV's Smart Hub or onscreen menu (just look for and click the icon on the menu bar that just says "Apps" or symbol that looks like four small TV screens inside a square). To add new apps, you need to establish a Samsung Account. App selections are grouped in various categories (What's New, Most Popular, Video, Games, Sports, Lifestyle, Information, and Education). Additional apps that are not listed in the provided categories may be found using Search, which is usually located in the top right corner of the Apps menu screen. If you find an app through a category or search that you want to add, click on it and select Install. Samsung Smart TV Add Apps Process. Although most apps can be downloaded for free, some may require a small fee, and some free apps may also require additional subscription or pay-per-view fees to access content. Along with the popular apps that are suited to the TV’s big screen, such as Netflix, Vudu, Hulu, and YouTube, there are music apps, such as Pandora, iHeart Radio, Spotify, and other unique apps may be based on games or apps that run on other devices. Also, there are apps to connect directly to your Facebook and Twitter accounts. Samsung's goal is to enable their TVs to be the hub of our home life. We shouldn't have to run to our computer to check on Facebook or Twitter or to post our status. We should be able to turn on the TV and have access to online movies and TV without any other device. We should be able to get a variety of content to help us in our daily lives — from morning exercises to hour-by-hour weather and current traffic reports helping you decide how to schedule your day. You can turn on your Samsung TV when you get up in the morning. One app will guide you through yoga poses (such as Bea Love Yoga), or you can opt for a more general health and fitness option with Fit Fusion. You can switch to another app (such as AccuWeather), and with a glance, you can keep up with the time and date, see and get the hour-by-hour weather forecast for the day. You can also get weather and local traffic info from Dashwhoa, as well as the latest business news and market reports from apps such as Bloomberg or Market Hub. To provide you with leisure time activities, in addition to all the entertainment apps, there are also several games for adults (Playworks, Easy Pool, and Jumbled Words), families (Monolopy), and kids (Angry Birds, Monkey Madness, El Dorado). You can also follow your favorite sport with apps, such as Baseball (MLB.TV), Ultimate Fighting (UFC.TV), or Fishing (Fishing TV). With several hundred apps available for some models, there are some that stand out. Samsung Apps are also included on Samsung's line of Blu-ray and UHD Blu-ray players. However, depending on year and model, the selection may be more limited than on Samsung Smart TVs. In addition to streaming apps, depending on the year and model, Samsung smart TV owners may be able to view content stored on network-connected PCs and media servers via Samsung SmartView (formerly AllShare/AllShare Play or SmartLink). What all this means is that the TV is not just a way to receive TV programs over-the-air, cable/satellite, but can stream media from your home network and the internet without the need to connect an additional external box, such as a Roku, Apple TV, Amazon Fire TV, or Google Chromecast, unless there is a specific service (or services) that are not available via Samsung Apps. In addition to entertainment and lifestyle apps and access to content stored on PCs and other networked devices, Samsung has taken the "hub of our home life" concept even further with it with it SmartThings apps platform, which allows select Samsung Smart TVs to be used to assist in controlling compatible smart-home devices. This functionality uses a combination of apps and optional external accessory devices that work together to control things such as lighting, thermostats, security devices, and appliances and view their status on the TV screen. SmartThings Mobile App and additional equipment purchases required. Samsung's incorporation of an app platform into many of their TVs provides users with expanded content access and meaningful interactivity that allows the TV to become a part of their lifestyle. Samsung's app selection is not only one of the most comprehensive available on a Smart TV, but the apps are also easy to use and manage. Depending on what model year your Samsung Smart determines what the Smart Hub may look like, what apps may be available, and how to access and manage them. Beginning with the 2018 model year, Samsung Smart TVs incorporate Bixby Voice control that can be used to navigate TV and content features, including app access and management. Alexa and Google Assistant support are also included beginning with the 2019 model year (Amazon Echo or Google Home device required). Only Samsung 3D TVs (no longer being made) will be able to access any apps that offer 3D content, and, if you don't have a Samsung UHD LED/LCD or QLED Smart TV, you will not be able to access any apps that provide 4K content. Also, some app availability may be restricted depending on the region or country. Are You New to Finding and Using Apps on Your Samsung Smart TV? Are There Samsung Apps for Smart TVs and Blu-ray Disc Players? Smart TVs: Are They Worth It?